Hundreds of firefighters paid tribute to the fallen heroes outside the bank of Lisbon Building in the Johannesburg CBD on Wednesday morning. 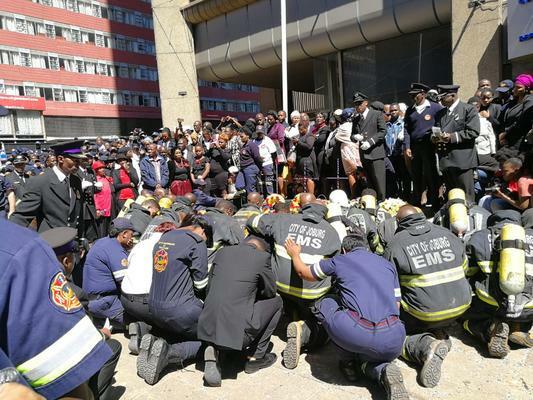 Emergency services, Johannesburg Metro Police, family, and friends gathered outside the building to commemorate Mduduzi Ndlovu, Khathutshelo Muedi, and Simphiwe Moropana who died last week while battling a blaze in the Joburg CBD. Gauteng EFF Chairperson Mandisa Mashego said both the municipality and provincial government should be blamed for the deaths of the three firefighters. “We have opened the case of murder against MEC for human settlement, MEC for health and Gauteng premier,” said Mashego. Saftu general secretary Zwelinzima Vavi said what was making them angry was that the tragedy should never have happened. “This thing should have been avoided, how can the government allow people to work in the building that doesn’t have fire extinguisher and water,” said Vavi angrily. A memorial service for the three fallen firefighters was underway at Ellis Park Arena.